When we conjure up thoughts about fruit, images like deep red strawberries, dripping-from-your-lips watermelon, and crisp apples come to mind. Yeah, that kind of stuff is synonymous with cooling off on hot summer days — in some parts of the world. In others, well, let’s just say we’ve all heard of the shenanigans that often hits the plates and markets of Asia. We’re talking deep-fried tarantulas, live octopus, you name it, people eat it. They aren’t afraid of expanding their taste horizons as much we are in the Western world. Take Dragonfruit for example. The magenta, scaly, spiky skin looks like it should be guarding a princess locked in the tallest tower of a castle. It would be easy to pass by that half-lizard looking thing. If you do, however, you won’t get to bite into the sweetness of the bright white flesh, polka-dotted with tiny black seeds. It resembles the meat of the kiwi fruit — well, that is, a fire breathing kiwi fruit. 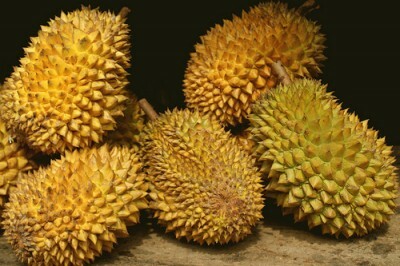 Anyone now drooling from the picture above of durian, know that its closest relative is the band Gwar. Jackfruits, rose apples, custard apples, sweet tamarind, persimmon, mangosteen, and green mangos are all mouth-wateringly described in the BootsnAll article. If you’re not sure what in the world I just mentioned (a mangosteen is actually a cross between a mango and Bruce Springsteen), rest assured that my computer’s spell check has no idea as well.